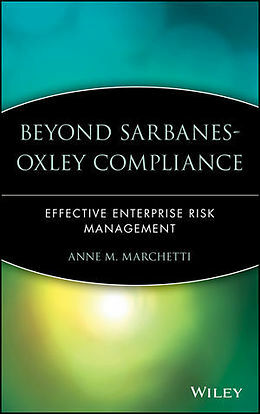 Designed to lead financial managers from initial compliance with the Sarbanes-Oxley Act, through ongoing maintenance and monitoring, Beyond Sarbanes-Oxley Compliance helps readers seize this opportunity to revitalize their business practice, drive greater performance, and transform their finance organization into a key contributor to the business. ANNE M. MARCHETTI is a practice director for Parson Consulting, a global consulting firm focused on finance, accounting, and business strategy. She is the national leader of their Sarbanes-Oxley practice. PART ONE: INITIAL COMPLIANCE. 1. Sarbanes-Oxley Act Overview. 2. Overview of Sarbanes-Oxley Sections 302, 404, and 409. 3. Determining Organizational Readiness. 4. The "Path" Approach to Compliance. PART TWO: ONGOING MAINTENANCE AND MONITORING. 5. Change Management. 6. Ongoing Compliance Activities. 7. Audit Function Considerations. 8. Other On-Going Compliance Issues. PART THREE: BEYOND COMPLIANCE. 9. Process Improvement Considerations. 10. International Financial Reporting Standards. 11. Non US Based Companies and Sarbanes-Oxley Compliance. 12. Financial Services Compliance Initiatives. Appendix A: Sarbanes-Oxley Section 302. Appendix B: Sarbanes-Oxley Section 404. Appendix C: Sarbanes-Oxley Section 409. Appendix D: Evaluation Questions to Understand the Current State of Control Processes. Appendix E: Internal Control Over Financial Reporting. Appendix F: Evaluating Control Deficiencies. Appendix G: Sample Documentation. Appendix H: AS2 Control Testing Provisions. Appendix I: Responsibilities of Internal Auditing. Appendix J: Actual Internal Control Disclosures. Index.